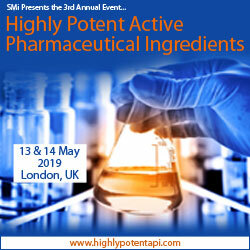 LONDON, UNITED KINGDOM, April 5, 2019 /EINPresswire.com/ -- Ester Lovsin Barle from Lonza AG will be speaking at SMi’s 3rd Annual Highly Potent Active Pharmaceutical Ingredients (HPAPI) Conference which will take place in London on 13th-14th May. She will be discussing the latest developments in the industry with a specific focus on occupational exposure limits. Ahead of the conference, SMi interviewed her where she gave a taster of what she will be discussing. Key sessions to be discussed in the area of hazard assessment and handling include – Practical elements in rolling out HPAPI projects; Occupational exposure limits; Manufacturing of Oncological Drug Products & Drug Substance by a CDMO; Demonstrating that exposure controls are effective and OH/containment strategy and NPI at AbbVie.